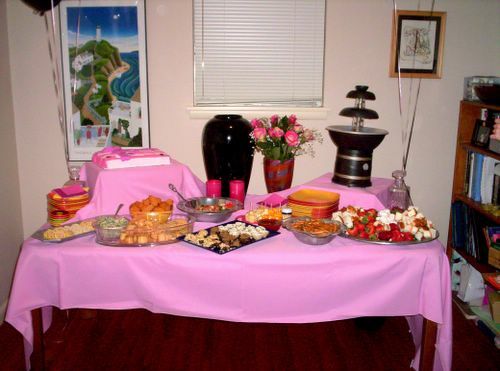 setup shot - THE FOOD AND DRINK (clearly one of the most important parts of any party!) were scrumptious. We also borrowed a chocolate fountain for the event (back right) that didn't work quite as well as we anticipated! (but did manage to get chocolate over my entire living room and kitchen of course! oops.) all and all setup and take down wasn't too bad! despite the work i absolutely love throwing parties and everyone seemed happy at this one so i was quite pleased! speacial thanks (from me) to elizabeth and kristen who came early and helped with food and table setup! yummers. and to eric (from me) for the help getting the liquor and limo! that was awesome! and to katie (from me) for everything she did w/ the cake and the party favors and overall! It was lots o' fun! !